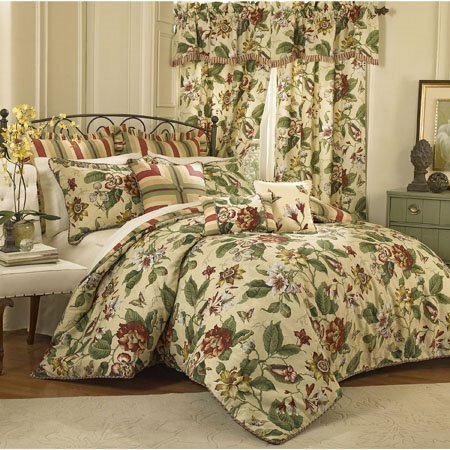 Laurel Springs Queen Waverly Comforter Set has leaves, vines, and exotic flowers including lilies, trumpet flowers, orchids, and passion flowers with fluttering butterflies and dragonflies. Done in rich jewel tones of crimson red, green, blue, and gold with cream accents on a natural ground. The comforter is cotton jacquard and woven in an all-over leaf design for textural interest. A coordinating stripe appears on the reverse of the comforter. Tri-colored braid trim accents the edge of the comforter and the shams. A 5-box pleat bed skirt finishes the ensemble for a tailored, designer look. Queen comforter set includes a 92” x 96” reversible comforter, two 21” x 26” standard shams, and a 60” x 80” tailored bedskirt with 15” drop. Machine wash cold, gentle cycle. Tumble dry low. 100% cotton.